A powerful new single-dose anti-malarial drug can significantly lower the risk of recurrent malaria from the Plasmodium vivax (P. vivax) species of the parasite, according to clinical trial results published today in the New England Journal of Medicine (NEJM). 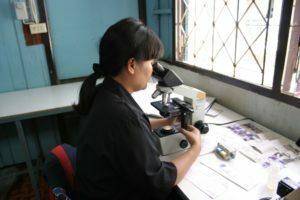 A scientist examines samples of P. Vivax in a laboratory in Thailand – one of the countries where recurrent malaria infections are most common. Results from the two randomized controlled studies of tafenoquine (TQ) involving nearly 800 patients in eight countries demonstrate that the one-dose oral medicine significantly reduced malaria recurrence from the P vivax species, with results approaching that of the standard 14-day treatment with primaquine. There are about 7.5 million clinical infections of P vivax every year, according to the World Malaria Report 2018. While not the deadliest malaria species, P vivax often lives dormant in the liver even after initial treatment for the acute infection, causing debilitating recurrent malaria episodes. This form of recurrent malaria affects primarily affects poor, rural populations of South East Asia, Latin America and parts of North Africa. In such settings, the single dose drug of tafenoquine could significantly boost cure rates, the research findings suggest, since adherence to a two-week drug course is difficult in poor, rural populations. The new drug treatment was developed jointly by GlaxoSmithKline and Medicines for Malaria Venture (MMV). Based on the clinical trial results first published today, the United States Food and Drug Administration had already approved TQ for use in July 2018, followed by the Australian Therapeutic Goods Administration in September 2018. See NEJM abstracts of the results from the two clinical trials here and here. Image Credits: Anna Wang / MMV.